Microsoft Soundscape is an app providing directional information and description of surroundings to Blind/Vision Impaired users through spatial 3D sound. Using Open Street Mapping, a number of customisable features facilitate discovery and interaction with surroundings. My Location – explore current location and direction of travel, nearby points of interest, street names and intersections. 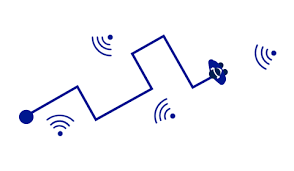 Audio Beacon – a directional cue guiding towards a set destination. Markers – tagging customisable locations, and allowing users to orient in relation to previously saved markers. Additional function buttons to explore multiple points of interest “Around Me” or “Ahead of Me”. Although not a Wayfinding app itself, Soundscape can be used in tandem with a navigational app, giving additional layers of information while still providing walking directions. Personalisations within the app include an option to toggle between male or female voice and either metric or imperial units of distance measurement. It must be noted that as the app relies on 3D sound, usage of stereo headphones is imperative. My usage preference would be a Bluetooth Bone Conducting headset, ensuring that ambient sounds are not obstructed. The control buttons on the headset would also allow for hands-free access to toggle functions within the app. Potentially a useful tool to aid navigation for independent travel, Soundscape could allow me to reach frequently visited locations with better accuracy while informing me of surroundings in unfamiliar spaces. Unfortunately, Microsoft Soundscape is not currently available to the Irish market, however, I eagerly await the release date.